Materials: shell in ash plywood or upholstered; armrests in ash wood, legs in steel tube and steel rod sled frame. Finishes: bleached or lacquered ash wood. Powder coated or chromed steel. Upholstered versions with fabric or leather. 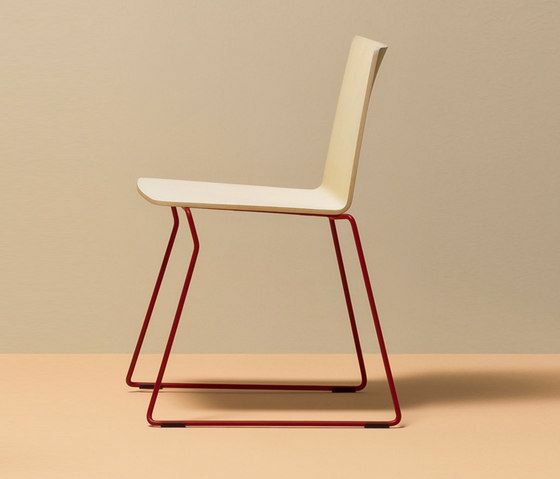 Osaka is a collection of seatings with a strong graphic impact whose construction elements remind the linear features of an ideogram, due to their pureness and simplicity. Like the oriental writing, where a symbol reaches the peak of the synthesis expressing a world of meanings, the rectilinear profile of Osaka reveals a welcoming three-dimensionality, completed by the tactile wellbeing of ash wood. The collection includes the chair and the armchair, available also in the upholstered versions. Finishes: bleached ashwood, cognac, mahogany and black colour stained. OSAKA Metal Osaka Metal seatings with steel legs and steel rod sled frame feature the functionality of the collection. The outcome is a great ergonomics and an increasingly light graphical effect. Shell available with ash plywood or upholstered. The stools have a steel rod sled frame and a low backrest.